Did Franklin really love beer? “Beer is proof that God loves us and wants to be happy” This quote is plastered all over taverns, tshirts, and beer mugs across America. It resonates with the working man or woman who enjoys unwinding with a cold one after a long days work. Perhaps one of the reasons it does so much is because it is attributed to possibly the ultimate self made working American, Benjamin Franklin. What most people do not know about this quote on their favorite tshirt is that is not exactly what Franklin stated. Posted on March 31, 2016 Author jwilliams4Leave a comment on Did Franklin really love beer? 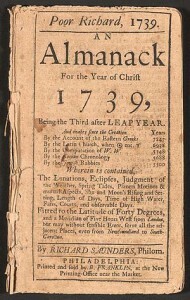 From 1732 to 17 58 Benjamin Franklin published the Poor Richards Almanack due to overwhelming success of other that were published in England at the time. Franklin was known for publishing under various pseudonyms such as “Silence DoGood” who we previously read about and “Richard Saunders” or “Poor Richard” was another. After learning about the origins of the pseudonym “Silence DoGood”, I became quite curious about how Benjamin Franklin came up with the pen name Richard Saunders. After further research I discovered that Franklin borrowed the name “Richard Saunders” from the seventeenth-century author of Rider’s British Merlin by Cardanus Rider which the letters rearranged is Richard Saunders. The Rider’s British Merlin was a popular British almanac which continued to be published throughout the eighteenth century. So Franklin is essential profiting off another man’s name indirectly. I found this quite funny due to the fact in the reading from class “Poor Richard Improved” Franklin gave the paranoid impression of everyone needing to look over their shoulder so another man wouldn’t steal from them. Franklin heeds this warning but as he does so is steals a man’s name and profits off it. Although it is Franklin’s own work I did find the situation very strange. The name may have come from Rider’s British Merlin however it is believed the persona and writing style was modeled after Jonathan Swift’s pseudonymous character, “Isaac Bickerstaff” by using Philomath and astrologer to predict things specifically the deaths of actual astrologers who wrote traditional almanacs. So Franklin picked parts of past almanac writers to formulate the and almanac to be above all others by combining all the best part from almanacs of the past. In class we discussed Franklin’s pen name for his almanacs, Richard Saunders, or “Poor Richard”. Franklin often used pseudonyms, and would usually create them from individuals he admired. For example, the pseudonym Silence Dogood was taken from the names of two essays published by notable preacher Cotton Mather Essays to do Good and Silentiarius: A Brief Essay on the Holy Silence and Godly Patience, that Sad Things are to be Entertained withal, so we see the Silence and the Dogood were taken from here. Now Richard Saunders was supposed to be a working class man readers of the almanac could take advice from, this is why he became “Poor Richard” after a few publications. Franklin wanted to write an almanac, and took his pseudonym from the secret writer of another influential almanac of the time the Rider’s British Merlin that was published in England from 1656 to around 1830. The author of the almanac was Cardanus Rider, widely accepted as a pen name for the real author. The name is actually an anagram that forms the name Ric_ard Saunder_, Richard Saunders being an English physician and astrologer of the time. And so Franklin took a name for his almanacs to be written under. Franklin not only used someone else’s name for his almanacs he also borrowed heavily from the satirist Jonathan Swift’s pen name character “Isaac Bickerstaff”. Swift wrote three letters under this pseudonym, an astrologer and philomath, predicting, incorrectly of course, the deaths of notable astrologers of the time. The fake predictions and false reporting of several astrologers’ deaths became a running joke in the early publications of Poor Richard’s Almanac. Now we see Franklin took the name of his almanac writer from one astrologist almanac writer, and the personality for this character mostly from Swift’s satirical astrologist, while poking fun at other astrologists along the way. Ross, John F. (September 1940). “The Character of Poor Richard: Its Source and Alteration”. PMLA (Modern Language Association) 55 (3): 785–794. There is limited information as to how this letter originally written in French evolves into the beer quote that is widely known today. Although Shapirio is able to trace the “beer version” as far back as 1996 to Beverage World, there is no evidence of Franklin using the quote. On the other hand, Franklin does express his love for beer in 1768 during a visit to a London printshop he had operated in forty years before. Upon rediscovering his old printing press, Franklin celebrated by ordering a gallon of porter to share with his fellow printers. 1. Franklin’s letter and translation from Memoirs of the Life and Writings of Benjamin Franklin, by his grandson, William Temple Franklin, 1819. 2. “Say What? Says Who? 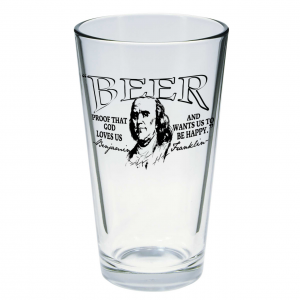 Benjamin Franklin on Beer – or Not.” Anchor Brewing. N.p., 29 Feb. 2012. Web. 29 Mar. 2016. 3. Shapiro, Fred. “Quotes Uncovered: Beer or Wine as Proof? – Freakonomics.”Freakonomics. N.p., 24 Mar. 2011. Web. 29 Mar. 2016. As such, Franklin did, essentially, say that an alcoholic beverage was “proof that God loves us, and loves to see us happy”, but it was wine rather than beer that he was discussing (and his actual language is considerably more eloquent than the popularized quote). The importance of this is debatable. While the quote is not grossly misinterpreted or misremembered, it is still a considerable deviance from Franklin’s legitimate words and as such is puzzling. Why his words have been twisted and reimagined in this way is somewhat unanswerable, but the vast recognition of the quote is telling as to its perseverance in the public imagination. Looking to the New York Times archive alone one can find countless articles discussing beer, brewing, and other such related topics, all of which manage to integrate this false quote at some point or another, often not bothering to attribute it to a source at all. In a Times article entitled How Beer Gave Us Civilization this quote is contributed to Franklin as something he “supposedly” said, but nothing else is said about it. Even those who insinuate their doubt as to this quote’s authenticity manage to further ingratiate it into popular culture! However, the real point here is that I was hard pressed to find a single Times article covering the subject of beer which didn’t feature this quote, branding it authentic or not. This alone is telling as to the ingrained popularity of the misquote. Still, how this started and why it stuck are likely unanswerable questions. It could easily be a misquote born of faulty memory, which would by no means be uncommon. There is also something to be said for Franklin’s prominence in American history and his status as a “true” American figure. There is quite possibly a public urge to paint such a figure as not only one of lofty aspirations and achievements but as relatable (something which is not particularly difficult to do with a figure such as Franklin, considering his upbringing and many of his more base, humorous writings). Whatever the reason, though, it was not beer that Franklin exalted–it was wine. Whether it is a tourist trap in Boston, a tacky souvenir store in Chicago, or a street-side vendor in San Francisco, the quote “Beer is proof that god loves us and wants us to be happy” is attributed to Benjamin Franklin. However, these shirts and signs are incorrect when they cite Franklin as the author. Franklin wrote in a letter to a French economist Abbe Morellet, who was a contributor to Encyclopédie ou Dictionnaire raisonné des sciences, des arts et des métiers, or the Systematic Dictionary of the Sciences, Arts, and Crafts. In the letter, Franklin conveys his love of not beer, but wine. Franklin enjoyed wine more than beer and even had a negative view towards the consumption of beer, especially when printers who have a mug or two at work. Rather, he extolled the virtues of wine and referenced the Biblical story of the wedding at Canna, where Jesus turned water into wine. The altering of the quote, however, is really meaningless in the grand scope of history. The confusion will not lead people to question the rule of law in their society or incite calls to destroy established institutions. It is a comical footnote, if that, that focuses on one of Americans favorite things, beer and one of its most famous founding fathers, Benjamin Franklin. There is a saying among beer lovers–“Beer is proof that God loves us and wants us to be happy”–which many believe was said by Benjamin Franklin; however, they would be mistaken. So alas, the proof and truth is in the wine, not beer. Although many people find the statement to be true, it’s credited author is most certainly false. There is no record of Franklin ever making such a remark. Franklin’s writings tell us about his thoughts God and happiness but unfortunately he doesn’t share his opinions on beer. That being said, there is a Franklin quote that could be the origin of the famous beer line. It’s easy to see the similarities to the famous quote but the fact of the matter is that Franklin seemed to prefer wine and never mentioned beer. Despite the confusion of the author, it is still a very popular saying and can be found on all sorts of beer memorabilia at breweries all over the country. This is the quote that has been used time and time again, whether it be printed on a t-shirt, a sign, or whatever other object a quote could fit on. For the people who know this quote, it is believed to be said by the one and only Benjamin Franklin. This makes people believe that Franklin loved beer and thought it was a gift from God himself. Is this true? No. This quote did not come from Benjamin Franklin. Instead, it is most likely derived from another quote which Franklin said about wine. Franklin instead stated “Behold the rain which descends from heaven upon our vineyards, there it enters the roots of the vines, to be changed into wine, a constant proof that God loves us, and loves to see us happy.” As it turns out, Franklin was more of a wine drinker rather than a beer one. 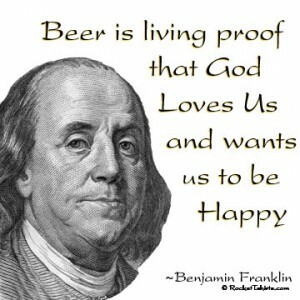 Over time, the quote has been misused and mistaken for Franklin actually thanking God for beer, not wine. In conclusion, the famous quote is actually untrue, and a twisted version of the real quote about wine that did come from Franklin. Quotes Uncovered: Beer or Wine as Proof? Posted on March 28, 2016 Author briannaduffy1 Comment on Did Franklin Love Beer? Many people have heard the quote “Beer is proof that God loves us and wants us to be happy”, and some actually believe Benjamin Franklin himself said it. T-shirts and bumper stickers are made with this quote crediting it to Franklin, but did he really say it? If he didn’t say it, then why does everyone think he did? 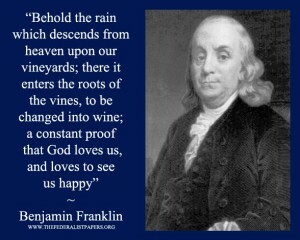 So, the reason people give Franklin the credit of saying this is because he actually said: “Behold the rain which descends from heaven upon our vineyards, and which incorporates itself with the grapes to be changed into wine; a constant proof that God loves us, and loves to see us happy!” in reference to wine, not beer. The “fake” quote about beer is just a silly saying paraphrased from Franklin’s original quote.